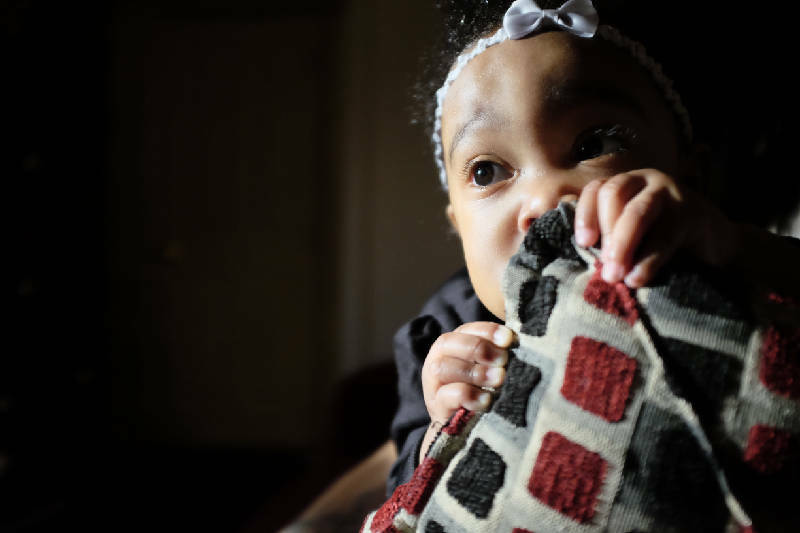 Four-month-old Journee Akins sits on her grandmother Ayesha Pankey's lap on Friday. Journee's mother, Jasmine Akins, was shot to death on Market Street in September, and Pankey and her son Jamaine now are raising Journee. * Police Services Center -- 3410 Amnicola Highway, open 8 a.m. to 5 p.m., Monday through Friday. * Christ Community Church -- 3129 New York Ave., between 5 p.m. and 7 p.m. on Wednesday and Friday, Dec. 17 and 19. Jasmine Akins planned the steps of her daughter's life before the baby could even walk. When Journee was a tiny baby, she imaged her girl growing up. What personality would develop? Would she be shy or outspoken? Would she have an attitude? She talked about getting Journee's ears pierced, and before Journee was even a few months old, Jasmine started planning her daughter's first birthday party. It would be a beach-themed party, Jasmine told her mother, Ayesha Pankey -- as long as it wasn't too cold for a beach party in May. But on Sept. 7, just days before Journee turned 4 months old, those dreams died. Akins, 19, was shot and killed in a parking lot on Market Street. She'd gone out for a friend's birthday party -- the first time she'd really spent time with friends since Journee had been born -- and was killed during a shootout around 2:30 a.m., two blocks south of the Chattanooga Choo Choo. Now Pankey is raising her granddaughter, piecing together the hopes and plans that Jasmine envisioned for Journee from memories and fading conversations. "I show Journee pictures of her mom every day," Pankey said. "She looks at them and laughs, she really does." But as Pankey struggles through the day-to-day, she's getting some unexpected help. Now 7 months old, Journee is a crawling, bubbling, smiling ball of trouble. She goes everywhere and gets into everything. She loves colors and can hold a bottle with one hand. She loves phones. "Like her mama," Pankey said with a smile. Jasmine didn't want Journee to go to day care until she was old enough to talk, so when Pankey leaves for work at a local hotel, she leaves Journee with family. As Pankey grieves for her own daughter, she's relearning and remembering what it's like to take care of a baby again. "It's a task," she said. A task she never expected to take on. Pankey's youngest son is 18, about to head off to basic training in the military. "I've got to do it all over again," Pankey said. "But these are just the cards I was dealt. I know my baby would want me to." Journee's father is involved, but plans to give Pankey primary custody of Journee, since Jasmine had primary custody before she died. Her slaying is still an active and unsolved case. Witnesses on the night she died described hearing what sounded like a gun battle, followed by screaming and yelling. Shortly after Jasmine was killed, a large group of family members and friends gathered at Pankey's home to remember Jasmine. Someone called police and complained that a party was going on and it was too loud. Not long after that, Lt. Eddy Chamberlin showed up on Pankey's doorstep. When he realized what was going on -- that the group was mourning the loss of the young mother --he talked to the neighbors and explained. "She is an awesome baby," he said. "He just fell in love with her," Pankey said. Chamberlin soon realized that Pankey needed help with supplies and necessities for Journee. So he decided to rally the police department. With help from the local Fraternal Order of Police, Chamberlin started a relief fund for Journee. Throughout December, officers and community members can donate supplies, toys and money to Journee. "You've got a mother who will never spend another Christmas with her daughter, and then you've got a daughter who has never -- and will never -- have a Christmas with her mother," Chamberlin said. "I can't imagine the double tragedy involved in that. It weighs heavily on me." To date, 18 people have been shot to death in Chattanooga this year. The youngest to die was 13 years old. The deaths haunt police. Chattanooga Police Chief Fred Fletcher says he will never forget the first call he took as a patrol officer. He had to tell a 29-year-old mother that her baby had died. Two decades later, he said, he can still remember the sounds, smells and feelings of that day. "When something like Jasmine Akin's murder happens, it really rocks police officers," Fletcher said. "Everyone wants to protect those who are vulnerable. It shakes us to our core." Chamberlin said he and other officers in the area stop by to visit Journee and Pankey often. "She needs the help of her community," said Lt. Craig Joel, who's organizing the drive with Chamberlin. "And it finally allows some small positive thing to come from what is obviously a tragedy." Pankey tries to keep Jasmines' memory alive. She's put together a souvenir box for Journee with little trinkets from her mom: her cellphone case, her scarf, photos. Lately, Journee hasn't been sleeping well, Pankey said. "And I wonder if she's missing her mom, or if it's just a baby thing," Pankey said. "I mean, she did have her mom for four months." Three months after Jasmine died, Pankey is still planning that beach birthday party. If it's too cold in May, she'll throw Journee two birthday parties: one on her birthday and another beach party during the summer. "I've got to have that party," Pankey said.